A leading bank in Saudi Arabia wanted to improve its loan process, eliminate error, reduce fraud and improve efficiencies. The client encountered challenges due to manual document maintenance, non-centralized rules, inefficient workflows, fraud detection, customer notification and other issues. 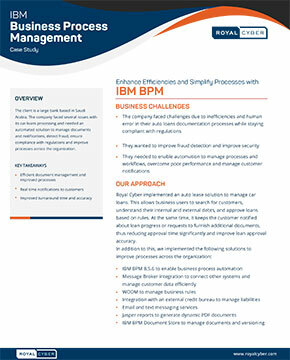 Royal Cyber implemented an auto lease solution and leveraged IBM Business Process Management (BPM), WebSphere Message Broker (WMB) and WebSphere Operational Decision Management (WODM) to improve processes across the organization.